I have never heard of a Game Studios so involved with its fansites and community as Blizzard Entertainment. They invite fansites to Blizzcon, to the Blizzard Worldwide Invitationals, fansite hands-on gameplay and Studio tours. The community managers send email and flash news, post twitter updates and keep in contact with fansites often year-round. This Christmas, Blizzard sent all members of the Fansites Program a special 2009 Holiday Card. I was curious why they have sent mail to me, and when I opened the envelope, there it was. Got me excited. Below you can see me holding the holiday card that arrived to my physical mailbox. You can download the 1804×1167 version here to set as your desktop wallpaper or to print at Kinkos. J!NX announced a limited special offer that allows you to get a 20% discount off your entire order. Simply type the promo code in caps: CHEERZ at checkout to enable the 20% discount. 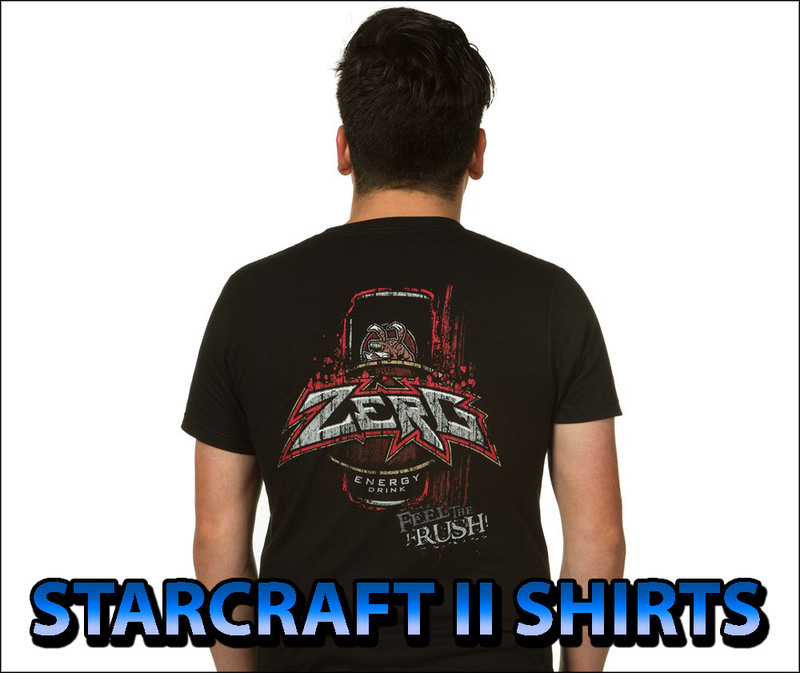 Go to the World of Warcraft or Starcraft II store to order your T-shirts for yourself or as a gift to friends & family. *As usual, not valid in combination with any offer. Expires 12/31/2009 at 11:59 PM EST. New Warcraft and Starcraft Dioramas? Sideshow Collectibles produced a limited edition of Tychus Findlay on 2007 when Blizzard announced Starcraft II was in development. The question ever since has been: Will Sideshow Collectible create more Starcraft dioramas? The short answer is yes, but not soon. Which character would you guarantee to pre-order if they made a diorama of? Will you make more pieces from Starcraft? My Tychus Findlay is starting to get lonely. Merry Christmas, Blizzard and Fans!!! It’s that time of the year when families get together in special times to celebrate Christmas, Hanukkah, or Kwanzaa. It’s meant to be a time of joy. I wish everyone happy holidays, especially all the people at Blizzard including those I have personally met or interacted with such as Chris Metzen, Mike Morhaime, Paul Sams, Frank Pearce, Ghostcrawler, Jeff Kaplan, Nethaera, Karune, Bashiok, Jay Wilson, J. Allen Brack, Wryxian, Changwoon Jung (who takes care of flight and hotel whenever I go to Blizzcon and to the Blizzard campus — thanks a bunch). I gotta thank Chris Metzen for many things, he creates fantasy and sci-fi worlds that have entertained and enlightened me over the years not only through the games, but through books, manga and comic books. Chris Metzen got me invited to the fansites’ Starcraft II single player hands-on back on July 17th where I interviewed him. It was great when I was recording video of a Starcraft II panel at Blizzcon, and I heard this voice calling my name. When I turned my face to the side, it was Chris Metzen waving at me. That was absolutely awesome, and I felt a lot of joy within to have someone I am a fanboy of remember me and say hi. His work and his worlds inspire to wish to be better each day. You can learn things from certain stories, that you would not learn normally in real life for lack of living those experiences. I emailed Chris Metzen a couple of weeks ago simply to apologize for that Sargeras article I wrote a few days ago. I had meant to write about it for a long time — ok, two years late — and used a photo by Gadgetress (OCRegister) of Chris Metzen from the 15th Anniversary of Warcraft celebration held at the Blizzard campus. The Sargeras article brought up the retcon, and possible reasons the creative team had to infuse a new direction to the story, while I was also exploring and parodying the reaction from fans when this retcon took place a couple of years ago. To make a long story short, in the parody I used this photo of Chris Metzen that looked like those facepalm images, and I added a few parody words concerning the retcon. You know, at that moment it looked fun to use the photo in the context of the article, but I still felt uneasy within. I emailed him to apologize. It’s not my nature to cause stress to people or make them feel bad, or do bad things on purpose. I’m a nice guy, honest and overall a good guy. A bit funny sometimes, which contrast with my shy personality. Chris Metzen was pretty cool about it, no hard feelings from him for using the photo in that context. However, I want to share that at the time that photo was taken, he had a speech about what all those 15 years at Blizzard creating all these worlds meant to him. It’s easy to say 15 years, but it’s a long time and a large chunk of your life dedicated to writing, inventing, jammin’ ideas within and with other fellow writers. It was a very emotional moment, that I can just grasp and imagine. It was a meaningful moment, that I am really sorry to have parodied. While there’s a lot of trolls out there who might think otherwise, many people — including me — love the work Chris Metzen, Micky Neilson and the Creative Team have done over the years. We are very proud of you, Chris. Merry Christmas! J!NX is letting WoW and Starcraft T-shirt fans know that it’s not yet too late to order in time for a Christmas gift with the Free 2-Day shipping offer. The talking Murloc plush toy is a must-have gift too. Think it’s too late to get a gift in time? Not with FREE 2-Day shipping! Buy 3 or more tees, get free 2-Day shipping anywhere in the US! Not valid with any other offer or sale item. Expires 12/22 @ 1 PM EST. Blizzard has launched a new contest aimed at fans who have leveled up their real life cooking experience. Use your skills to create food shaped like anything from the main Blizzard franchises: popular characters, mobs, buildings, or objects. What can be better than fresh-baked cookies or cakes? Cookies, cakes, and scrumptious desserts created with care to represent elements of the Warcraft, StarCraft, or Diablo universes, of course! We’re holding our Blizzard Holiday Dessert contest again and calling out all those talented bakers and pastry chefs to get out their flour, sugar, and rolling pins to create something amazing to tantalize the eye. Find out more on our contest page! Pocket Books invited me to witness their Blizzcon 2009 book signing event on Saturday at 4pm where Jaime Costas and her husband raffled 40 copies of the World of Warcraft: Arthas Collector’s Edition. I brought my video camera and captured most of the event. There was a large amount of fans awaiting to win one of those, but also to get their own merchandise signed by Christie Golden. I could see some World of Warcraft: Arthas (Normal Edition) and Starcraft: The Dark Templar trilogy brought by fans to be signed by the author. The place was crowded with fans that were excited to meet her. If you recognize a friend in the two videos, let them know the link to this page. It’s available to all attendees as a memento. I was glad to be there. I realized I haven’t taken photos of myself with the authors in all the events I have been attending. This time I had the chance to take a photo with all the publishers and book writers. I have been in contact with all of them quite often. It feels like family already. Watch video # 1 below, and video # 2 here. Flux (Diii.net) and I shared a room at the hotel. When I entered the room, late night on Saturday after Blizzcon 2009 ended, he showed me a large paper. He walked by a restaurant, and an employee asked him if he was at Blizzcon. When Flux said yes, he handed him the Restaurant menu. Flux gave me the menu to scan it for our audience. He considered it quitely funny, and indeed it is. The McCormick & Schmick’s Restaurant went through all the trouble to rename most of their menu and print it to catch attention from Blizzcon 2009 visitors. The menu got tons of references from Diablo, World of Warcraft and Starcraft II. Featured Species: This Halibut was captured with a spear off of Gulf of Westmarch by Deckard Cain on the “Stay a while and Listen”. Check out other games’ references in the menu after the break. The Overmind’s Atlantic Salmon Zerus—stuffed with crab, bay shrimp, Brie Cheese, Chive Lemon Butter. A Favorite amongst the Zerg Swarm.